People often write to comment on the email special. I always enjoy the replies... especially when they provide additional information, or a new insight on the topic at hand. Last week I mentioned that Best Buy was going to start carrying guitars in select locations (not Pittsburgh). Adam S. wrote from Tennessee to describe, in detail, the Best Buy in his town. I was surprised to hear how seriously they have taken it. He said the music department is a separate room in the back of the store, and it's well-stocked with name-brand instruments, amps and accessories. It appears that they are going to go head-to-head with the other "big box" instrument chain stores. I wonder how that will work out? The Danelectro/Sears connection is interesting. Over the years many folks have asked us about guitars that appear to be Danelectros, but have a different brand name. It wasn't long before Sears realized that it would be beneficial for them if they had their own proprietary brand names. So they requested that many manufacturers re-brand the products that Sears distributed. In 1915 Sears added a new-fangled electronic gizmo, the "radio," to their product line. And they invented a brand name to use on their radios: "Silvertone." In the 1930s, they extended the use of this brand to cover their guitars as well. By the 1940s, all guitars sold by Sears were labeled "Silvertone," regardless of who originally manufactured them. In the early 1950s, the newest new-fangled gizmo was the solid-body electric guitar. As you would guess, Sears wanted to sell those as well. Sears turned to Nat Daniel, and he designed a new solid-body guitar for them, which debuted as the Silvertone Model 1375 in the 1954 Sears catalog. 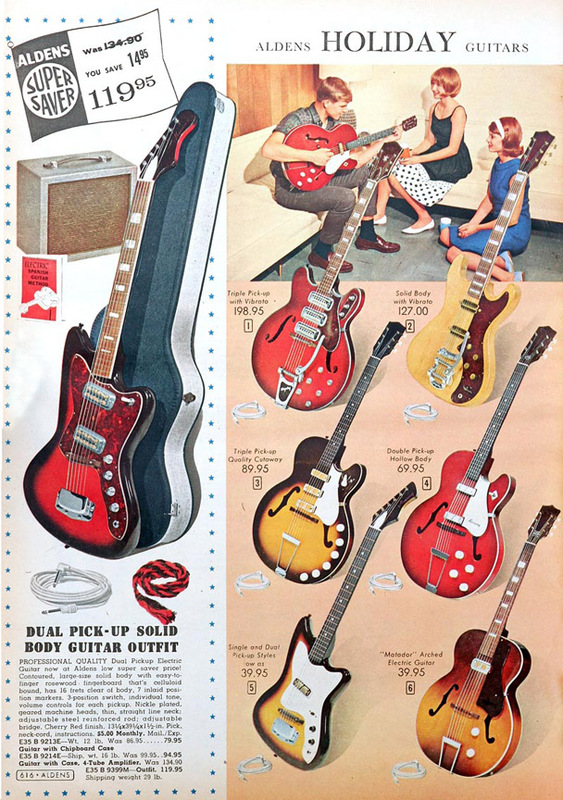 Sears, though, wanted to offer the greatest selection of everything, so by 1956 they were also purchasing guitars from three local Chicago manufacturers, Harmony, Kay and National/Valco. These, too, were branded Silvertone. Here's a page from the 1958 Sears catalog, showing acoustic archtop and flat-top guitars made by Harmony, and a solid-body electric guitar, and amp, made by Danelectro. Nat Daniel liked to experiment with new exotic guitar designs, like the Longhorn Bass mentioned in last week's email. But he kept the new designs for his own brand, Danelectro. The only models he sold to Sears through the 1950s were his single-cutaway guitars. Harmony, though, had no problem offering almost their entire product line to Sears, and by 1960 most of the Silvertone guitars were made by Harmony. But in 1962 Nat had a new brainstorm, and he offered it exclusively to Sears! It was the Silvertone Model 1448, or as it is more commonly known, the "amp-in-case" model. From 1962 until 1968 Sears sold thousands and thousands (and thousands!) of the Danelectro-made Amp-in-Case guitars. Here's John with a Silvertone 1448. It is interesting to note that although historically Danelectro guitars are heavily associated with Sears, during the prime every-baby-boomer-wants-a-guitar era (1964 and 1965), the only Danelectro guitars sold at Sears were the amp-in-case models. The rest of Sears' Silvertone guitars were made by Harmony. Here's a page from the 1966 Sears catalog, showing the two Danelectro-made amp-in-case models and the two Danelectro basses. Guitars 1, 2, 6, 7 and 10 were made by Harmony. Guitars 11 and 12 were made by Kay. Everything says "Silvertone." Here's me with my 1966 Model 1442 Bass. I used to stare at these in the catalog. It only took me thirty-nine years to get one! Here's a page from the following year, 1967. It's very similar, except that the amp-in-case guitars now feature the slim-edged "Hornet" body style. And THAT'S why you can find Danelectro, Harmony, Kay, National/Valco (and their brand Supro) guitars that are labeled "Silvertone." In most cases they are the exact same models marketed by those manufacturers under their own brand names. Now, you're probably saying to yourself, "Yeah, but what about...??" Yes, you're right! Those same guitars are also floating around with other names. Several other catalog companies also bought guitars from these same manufacturers! And just like Sears, they labeled them with their own brands. - Guitars sold through Spiegel were marked "Old Kraftsman." - Guitars sold through the Western Auto stores were named "Truetone." - Guitars sold through the Aldens mail-order catalog were named "Holiday." - Guitars sold through Montgomery Ward were labeled "Airline." Here's a page from the 1965 Alden's catalog. Guitar #2 was made by Kay. The other six "Holiday" guitars were made by Harmony. So...... if you're looking at a guitar sold in the 1950s or `60s by a mail order catalog company or a large department store chain... you can't judge the make by the name on the headstock. But stop in anytime and show it to us. We'll tell you who really made it. `Cause, you know, we love guitars! PS: Although the percentage of Silvertone guitars that were made by Danelectro varied over the years, Danelectro monopolized the Silvertone amp line. Nearly all Silvertone amps from 1948 through 1968 came from the Danelectro factory. PPS: Speaking of the above brand names, the brands "Silvertone," "Airline," "Supro," "Harmony," "Danelectro," "Kay," and "National" all fell into disuse in the 1970s and `80s, and were eventually sold off to other folks. During the 1990s these vintage American names were used on some pretty bad imported cheapo guitars. In recent years, though, quality historic reproductions have been made using the classic brand names. We're happy to have reissue Harmony, Danelectro and Airline guitars here in the store now. Here's John with a new Airline guitar, a reissue of the National/Valco-made guitar sold through Montgomery Ward in the early 1960s. PPPS: When I was looking through the old Sears catalogs I found this cute page from 1964... "Big Toy Values," where everything is $1.66. You could buy all four Beatle dolls for $6.64! A few weeks ago a set sold on ebay for $250. Here's our Pittsburgh Guitars set. PPPPS: Speaking of the Beatles, Scott and John's band, The Elliotts, have been invited to go to Liverpool in a few weeks to play at The Cavern during International Beatle Week! We couldn't be prouder!!!!! Perhaps when they get back we'll start marketing THIS doll set! The emails started pouring in yesterday at 1:54 PM, when it was announced that Les Paul had passed away. Folks were writing things like, "He's the man who's responsible for your industry..." or "Isn't he the 'father of the electric guitar'?," or "He invented the electric guitar, didn't he?" The first phone call was from KDKA radio. They invited me to be on their show this morning. If you heard my segment, you may have noticed me trying to set the record straight. BUT, Les Paul did not invent the electric guitar, he didn't invent the sold-body electric guitar, and he didn't even design the famous guitar that bears his name. Les Paul got an early start in show business, and by the time he was seventeen he was a professional musician. He was also a natural tinkerer and inventor. Early on he was fascinated with electrifying his acoustic guitar. Pickups had already been around for several years when he started adding them to his instruments. Noticing the feedback he was getting with his hollow guitars, he experimented with a solid section in the middle of his guitar. For example, he cut his Epiphone archtop down the center, mounted pickups to a 4x4 piece of lumber, and re-attached the sides of the guitar to the 4x4. He even used this instrument in performances. So, yes, he was an innovator. And yes, he recognized the merits of a solid, or at least semi-solid, guitar. But as happens so often in history when new inventions are on the horizon, other folks were drawing the same conclusions. As Les Paul was wiring and re-wiring his experimental instrument, Paul Bigsby was actually designing and manufacturing, from scratch, a solid-body electric guitar. When Leo Fender saw Bigsby's guitar, he decided he could mass-produce a similar instrument, and he did. In 1950 Leo's electric solid-body started to make waves in the marketplace, and the grand ol' company, Gibson, finally started to take note. They decided they didn't want to miss out on this new fad, so they set about designing their own version of a solid-body guitar. Many, many prototypes were made, and eventually they settled on the shape we now know and love. To emphasize the difference between their fancy guitar and Leo's "plank" body Telecaster, Gibson's new instrument featured a carved arched top, something they knew that Leo Fender couldn't do, sisnce he didn't have the necessary equipment. Once Gibson had their guitar designed, they realized that they could certainly steal the market away from Fender if they had a famous endorser. And the most famous guitarist in America in 1951 was Les Paul. He and Mary Ford were riding the top of the charts with million-selling recordings, and they even had their own radio show. Furthermore, the folks at Gibson were aware of Les's experimental guitars. Even though Les was a serious Epiphone fan, Gibson felt that they could win him over with their new model. They showed him a prototype, offered to name it after him, and a deal was made. Les suggested that they paint it gold so it would look classy, and he insisted that they use the new combination bridge/tailpiece that he invented. Gibson agreed to pay him a royalty on every one sold, as long as he only appeared in public playing Gibson instruments. So, until the new guitars were available for sale, Les and Mary removed the nameplates from their Epiphone archtops and stenciled "Gibson" logos on them. In May 1952, Gibson introduced the new "Les Paul Model" solid-body electric guitar. To milk Les Paul's celebrity, Gibson's promotional materials said, "designed by Les Paul," which of course, was not true. Here's John with a 1952 Les Paul. Unfortunately, Gibson's design department didn't change their prototype's neck angle to account for the height of Les Paul's combination bridge/tailpiece, it never functioned the way he intended. Gibson dropped it in less than a year and replaced it with a bridge of their own design. Les' requested goldtop finish lasted until 1958. So, yes... Les Paul is one of the world's most famous guitar players... And, yes, the Gibson Les Paul Model is one of the world's most famous guitars. But his association with that guitar is one of endorser, not inventor. And what is their story? I hoped you'd ask!! Les Paul was a big fan of low-impedance pickups. Although they have a lower output signal, low impedance pickups provide a purer sound for recording, with a wider frequency range. And with their wider range they have more "adjustability" with regard to a guitar's tone circuitry. In 1970 Gibson introduced a new version of the Les Paul guitar with many features that Les Paul personally had long been requesting, and they called it the "Les Paul Personal." In addition to low-impedance pickups, the guitar features a complicated tone circuit, including an 11-position "Decade" switch that "alters the treble harmonics," and a three position switch that re-routes the signal path through guitar's tone controls and switching system. PLUS it has a built-in microphone input, with volume control! THIS was the kind of guitar that Les Paul himself wanted to use. Here's John with a 1970 Les Paul Personal. Except for the low-to-high transformer switch, the Les Paul Recording model features the same circuitry as the Les Paul Personal. But cutting one more hole in the top of the guitar was too much for Gibson. So with the Recording model all of the controls, including the pickup selector switch were mounted on a plastic plate. They also realized that only Les Paul wanted to plug a mic into his guitar, so they discontinued the mic input and its related volume control. Here's a catalog picture of the Les Paul Recording guitar. The Les Paul Recording model was not very successful for Gibson. They sold 5,380 of them between 1971 and 1979, compared to 50,605 Les Paul Customs, 35,520 Les Paul Deluxes, and 11,155 Les Paul Standards during the same time frame. But it was VERY popular with Les Paul. He used the Les Paul Recording model exclusively for the next 38 years. Here's Les Paul at The Iridium Club in New York, using his Les Paul Recording guitar. To recap... This morning on the radio, the host said to me, "You mean Les Paul didn't invent the electric guitar? Are we myth-busting here?" Well, not exactly. Les Paul never claimed to have invented the electric guitar. He just claimed to love it. And he played the heck out of it. And he inspired thousands of players. And he designed a way to overdub multiple tracks. And he was a pioneer in using tape echo and close mic'ing techniques. And his name is on so many hundreds of thousands of guitars that Les Paul, the guitar, is as famous as Les Paul, the guitarist. And that's quite an impressive legacy to leave behind. PS: I mentioned that Les Paul was a born tinkerer. As soon as he received his production model Les Paul guitars he started to modify them for his own use. Here are two pictures from 1953. As you can see, he has already changed the tailpiece, changed the pickups, re-wired it and changed the input position, and even changed the knobs! PPS: In 1970, when Gibson introduced the Les Paul Personal, they also offered a plainer version... a "standard" vs. a "custom"... with chrome hardware instead of gold, an unbound headstock, and minus the mic input. The plainer version was called the "Les Paul Professional." It was discontinued in 1971, along with the Les Paul Personal, when the the Les Paul Recording model was introduced. PPPS: Just so we don't leave anything out... In 1975 Gibson added a bass version of the Recording model and called it the Les Paul Triumph Bass. Here's John with a 1975 Les Paul Triumph Bass. Here's a catalog photo of the guitar and bass models. Here's a close-up of the control panels. Glorf was pleased with his performance as he looked out at his fellow cavemen. His famous hollow-tree-trunk drumming was the area's second highest rated entertainment event... right after the weekly "Neanderthals Got Talent." Suddenly, from the other side of the clearing, came a startling sound: "TWACK-TWACK-TWACKA-TWACK." Everyone turned; and much to his dismay, Glorf saw that his rival Clarg had found a larger hollow-tree-trunk. And that's when the quest for louder musical instruments began. Now, let's jump ahead to the early 1900s... Our favorite instrument, the guitar, was gradually getting more popular thanks to the invention of steel and bronze strings, which were a vast volume improvement over the gut strings of the 1800s. Guitars were getting bigger, too. Martin named their giant new model the "dreadnought," after the largest battleship of the era. But even with the louder strings, and the increasing size of the body, the guitar was not a particularly booming instrument. The Dopyera brothers had some success by mounting resonating cones in the face of the guitar... and their National Tri-Cone was loud. But it was also metallic sounding. However, in the early 1920s something new was in the wind... or, more specifically, in wires being strung everywhere. Electricity was making inroads into everyday life. Radios and record players used electrically amplified sound, and it was only a matter of time before folks started to apply electric amplification to guitars. At Gibson, their top acoustic engineer, Lloyd Loar (who previously designed the finest mandolin ever made, the Gibson F-5) began to develop electrified instruments. Even in those days, though, Gibson had an old-school corporate attitude and they resisted Loar's new, electric concepts. (This despite the fact that in 1923 he built a fully functioning electric viola.) So Loar left Gibson in 1924. Meanwhile, in California, musician and inventor George Beauchamp also experimented with electrifying instruments. In 1924 he attached a phonograph cartridge to a 2x4 to make a test electric guitar. Eventually he was able to design his own pickup, and in 1931 he made plans to manufacture the first commercially available electric guitar. He joined forces with a friend who owned a tool & die plant, Adolph Rickenbacker, and in 1932 they introduced the Electro A-25. Since the most popular musical style of the day was Hawaiian music, this instrument was designed as a lap steel. (So you could Lei down some licks!) Because of its shape, it quickly got the nickname "The Frying Pan." Here's a picture of a Rickenbacker Electro A-25. Later in 1932, Rickenbacker also introduced an electric archtop guitar with the same Beauchamp-designed pickup. At this point, Gibson finally saw the sparks on the wall, and jumped into electric-land. By 1935 they were making their own electric guitars. And in keeping with the musical fashion of the time, their models were either amplified archtops or solid-body Hawaiian lap steels. But not everyone was as conservative as Gibson. While most of the solid-body electrics made up to that point were Hawaiian lap steel guitars, some folks could see the merits of a solid "Spanish"-style guitar. (In that era the term "Spanish guitar" referred to a guitar that had a rounded neck, and was played in what we now consider a normal guitar playing position... you know, like this.) In 1939, Slingerland (the famous drum company) introduced a round neck electric solid-body guitar called the Songster. Here's a 1939 Slingerland Songster. As you can see, the design is getting closer to the solid-bodies of the 1950s. In 1940 Les Paul fashioned a guitar from a solid 4x4 piece of pine sandwiched between the sides of his Epiphone archtop. He called it "The Log." Here's a picture of "The Log." And in 1941, a little-known luthier from Burlington, Iowa, named O.W. Appleton designed a guitar that told the future. Appleton approached Gibson with the design, just as Les Paul had done with his "Log." And as with Les Paul, Gibson turned Appleton down. But I think you'll agree, the design looks familiar! Here's a picture of O. W. Appleton's 1941 "APP" guitar. Unfortunately, all of this electric guitar creativity was interrupted by something that would change everyone's lives... World War II. Supplies for guitar making dried up. And many guitar companies, like other manufacturing entities, redirected their factories to make products for the war. The mid-1940s were a difficult time for everyone. Some guitar companies went out of business and the ones that made it through the war took years to recover. Fortunately, by 1947 things started to look up, and the electric guitar had a bright new future. But we'll save that for another day! And that's the story of pre-World War II electric guitars! PS: Years ago, when I first started to study electric guitars, I didn't view laptop Hawaiian steel guitars as legitimate electrics. But I was wrong. Early electric guitar manufacturers went in that direction, because that's where the market was. Hawaiian music was extremely popular. Perhaps it was due to the sadness of the early 1930's, when the country was in the throes of the depression. The calm Hawaiian music took folks to a magical and romantic place. It offered an emotional escape from the troubled economic times. PPS: World War II shattered the peaceful image of Hawaii. And after the war, when guitar manufacturers recovered from rationed supplies, they saw the Hawaiian music market dry up. So they took their experience with laptop steel guitars to the world of round-neck electrics... which led to... Rock & Roll! PPPS: And, of course, lap steel guitars also led to pedal steel guitars, which became the cornerstone of country music. PPPPS: Les Paul's "Log" guitar involved putting the sides of his Epiphone onto the electric center section. Five years earlier the legendary guitarist Alvino Rey did a similar thing with his Rickenbacker A-25. Here's a picture of Alvino Rey with the Horace Heidt Orchestra in 1935. Leaning next to him is his electric Rickenbacker A-25 mounted into an acoustic guitar body. PPPPPS: In this email, as well as in previous stories, I've referred to Gibson as a "corporation." Unlike Fender (run for the first 19 years by Leo Fender) or Martin (run for the last 175 years by a member of the Martin family), Gibson has been a multi-owner corporation almost from the start. Orville Gibson started making guitars and mandolins in 1884. Although the output from his one-man shop was limited, his new instrument designs were well respected. Eight years later, in 1902, Orville and five investors founded the "Gibson Mandolin-Guitar Manufacturing Company." Unfortunately, there were issues between Orville and the other five, and in 1903 Orville left the company. Orville Gibson's participation in the Gibson Company lasted less than a year. PPPPPPS: Way up above I mentioned the Stromberg-Voisinet Company and their electric guitar pickup. Shortly after the introduction of this pickup the company evolved into a more familiar name, The Kay Musical Instrument Company. You know how when you start to film your movie about an asteroid coming to destroy the earth, then suddenly other people begin making a movie about asteroids destroying the earth? Or when you invent a computer platform with lots of colors and cute little icons, then suddenly every company that was making a black-screen-with-blinking-cursor suddenly invents something called "Windows"? Or when you decide to put high-fructose corn syrup in your brand of soft drink, and then suddenly everyone is putting high-fructose corn syrup in... everything? The guitar manufacturing biz is just like that. In the late 1940s Gibson was contemplating adding a solid-body electric to their line (and they had already seen several experimental examples, like O.W. Appleton's amazing APP guitar from 1941), but they hesitated to make the leap. Gibson was proud of their acoustic guitar heritage and they didn't want to appear to be too "wild." But, let's face it, when you're sitting around the boardroom discussing new ideas... ("Hey, how about a show where contestants sing AND dance!")... nothing gets things moving faster than seeing someone ELSE make money. And as soon as that young California radical Leo Fender started to market his solid-body electric, the powers-that-be at Gibson took notice. And the solid-body Les Paul was put into production ASAP. When Leo Fender introduced a REALLY radical idea, the solid-body electric bass, Gibson quickly carved one out themselves, called the Gibson "Electric Bass." Meanwhile, in the mid 1950s, as Gibson continued to fine-tune their Les Paul Model, Leo continued his outside-the-case thinking with a second new model, the Stratocaster. So you would think that the fast-on-his-feet youngster, Leo Fender, would be continually beating the corporate Gibson to the punch. BUT, Gibson actually beat Fender to the marketplace with regard to one demographic... smaller people! From the very beginning, Leo Fender decided to also offer the buying public a more affordable version of his two-pickup Telecaster: a one-pickup model, called the Esquire. Naturally (a few years later) (1954, to be exact) Gibson decided to offer a one pickup version of the Les Paul. And they offered two color choices: A one-pickup sunburst guitar, called the "Les Paul Junior," and a yellow (limed-mahogany) version called the "Les Paul TV Model." But here's where Gibson eased ahead of Fender. In addition to the regular one-pickup models, they also introduced 3/4 scale, one-pickup guitars. They used the same body as the full-size guitar, but with a 3/4 size neck. The sunburst version was called the "Les Paul Junior 3/4." The yellow version, although never officially listed in a catalog, was the "Les Paul TV Model 3/4." The "Les Paul TV Model 3/4" was introduced in 1954, the same year as its full-size sibling. And the Les Paul Junior 3/4 a little over a year later. Here's John with a 1957 Les Paul TV Model and a 1954 Les Paul TV 3/4. Note that they are the same body, with different size necks. Here's John with a 1955 Les Paul Junior, and a 1957 Les Paul Junior 3/4. In 1959 Gibson changed the Les Paul Juniors and the Les Paul TV Models from single-cutaways to double cutaways. (And they changed the color of the Junior from sunburst to red.) And they still made 3/4 versions. Here's John with a 1960 Les Paul Junior and a 1960 Les Paul Junior 3/4. In mid-1956 Leo Fender introduced his first 3/4 scale guitar. Rather than simply swap out the neck on a Telecaster, Leo opted to create a new model. The one pickup version was called the Musicmaster and the two pickup version was called the Duo-Sonic. Here's me with a 1961 3/4 scale Fender Musicmaster. As I was typing this I started to ponder: The Fender Musicmaster and Duo-Sonics were dedicated 3/4 scale guitars. But the Gibson Les Paul Junior 3/4 was just a full-size model with a changed neck. So, did Gibson ever make a guitar that was specifically designed to ONLY be a 3/4 scale guitar? I just went downstairs and discussed it with Mark... And we don't think Gibson ever made an electric guitar that was only available in a 3/4 size... Sure, there's the Gibson Byrdland... a thinline, cutaway, electric hollow-body, with a neck that's shorter than other Gibson necks... But it's not short enough to really be considered a 3/4 size. We're gonna have to ponder this some more.... `Cause we MUST know these things! Not that it's REALLY important... like knowing how bad high-fructose corn syrup is for you... But perhaps we can draw some conclusion... that will offer positive insight into our lives... I mean, after all, what IS important? PS: In 1959 Gibson introduced a guitar that was even further down the economic food-chain than the Les Paul Junior... the budget priced Gibson Melody Maker. In keeping with their history of offering a 3/4 option, the Melody Maker was available in both a normal scale or with a 3/4 neck. Here's John with a 1965 Melody Maker (actually a Melody Maker-D) and a 1965 Melody Maker 3/4. PPPS: Many, many years ago, when I was young and innocent, I thought the term "Les Paul Junior" meant a smaller version of the Les Paul. ("Junior" = "small") But historically Gibson has used the term "Junior" to mean a solid-body electric with only one pickup. PPPPS: When we're sitting around at vintage guitar shows gabbing with other vintage guitar guys, we sometimes refer to the 3/4 size model as a "Les Paul Junior Junior." Ha! THAT'S the kind of professional Hollywood-style comedy writing that goes on at guitar shows! I don't know HOW we DO it! PPPPPS: In 1964 Fender started to offer the Musicmaster and the Duo-sonic in a slightly longer scale length... the same scale as a Jaguar, but still shorter than a Strat or Tele. The slightly longer ones were called the Musicmaster II and the Duo-Sonic II. PPPPPPS: In 1965 Fender upgraded the Duo-sonic with a vibrato system and called it the Mustang. The Mustang was available in both the short (Duo-Sonic) scale and the not-quite-as-short (Duo-Sonic II) scale. PPPPPPPS: The most famous 3/4 scale guitar player? John Lennon, with his 3/4 scale Rickenbacker 325. PPPPPPPPS: The most famous player to use a Gibson Les Paul Junior 3/4: none. PPPPPPPPPS: The most famous player to use the slightly-longer-than-3/4-size Fender Mustang: Kurt Cobain. PPPPPPPPPPS: OK, that's all I've got. PPPPPPPPPPPS: Oh, wait... one more thing. In the picture above, of John with the Les Paul TV and the Les Paul TV 3/4... (here it is again)... the body of the 3/4 size guitar is significantly more yellow than the other one. You're probably wondering why. The Les Paul Junior and TV Model guitars are made of mahogany. But the very first ones, from early 1954, were made of maple. That Les Paul TV 3/4 is an early `54, with a maple body. The lighter colored wood is mostly responsible for the color difference. Also, Gibson was a bit inconsistent with the yellow paint on the TV models throughout the 1950s. PPPPPPPPPPPPS: OK. Now I'm done. PPPPPPPPPPPPPS: Wait... and this is the last one... In the picture above of John with the two 1960 Juniors (here), the 3/4 Junior has an unusual white pickguard. You probably thought THAT was strange! It all goes back to the NAMM Show (NAMM = National Association Of Music Merchants). Guitar manufacturers often make demo models of guitars to take to the trade shows. In the late 1950s Gibson sometimes put white pickguards on their NAMM show display models. Our 1960 Les Paul 3/4 was made for the 1960 NAMM show, and thus the odd white pickguard.